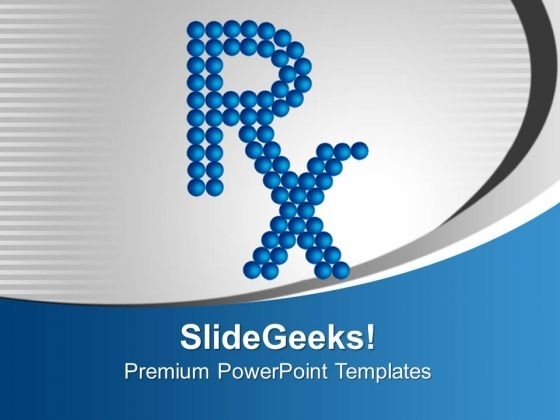 Deliver amazing Presentations with our above template which consists of an image of RX pharmacy symbol made of balls. This image represents the concept of medical used for prescriptions. Health, wealth and happiness are the proverbial good wishes we bestow on our friends and family. You have the means to help people achieve the first. Expound on the process using our innovative templates. Attain victory with our Rx Symbol PowerPoint Templates And PowerPoint Themes 1012. You will come out on top. Our Rx Symbol PowerPoint Templates And PowerPoint Themes 1012 don't fiddle with facts. They are fearlessly factual.